← College Hockey Roundup: Paul Kelly Resigns; More Trouble at BU; Hunwick for Hobey? 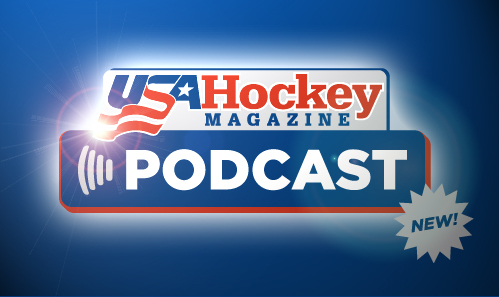 Earlier Thursday, I joined Harry Thompson, managing editor of USA Hockey Magazine, on the USA Hockey Magazine Podcast to cover a variety of topics. Harry and I talked about the United States of Hockey, my time at the National Team Development Program, and spent the bulk of the time talking about U.S. National Under-17 Team forward Hudson Fasching. I wrote a feature about Fasching and his incredible family for the March 2012 issue of USA Hockey Magazine. To get a bit of a preview of that story and to learn more about Hudson Fasching, check out the podcast right here. You can also download it and subscribe to the podcast on iTunes. This entry was posted in Blog News, NCAA, NTDP, U.S. National Teams, USA Hockey. Bookmark the permalink.